Sports Store is a responsive Magento theme specially designed for online sport stores. It supports tablet and Smartphone viewing resolutions apart from normal desktops. The theme supports multiple language and currency options and comes with a flexible design scheme that can be easily customized as per your requirement. The Theme also comes with multiple image sliders that allow you to easily create an attractive slideshow of your featured products. It requires Magento community edition 1.7 and higher and is cross-browser compatible. The homepage comes with a full-width image slider for your featured banners. Also included is a scroller for your new products. The homepage also has multiple call to action spaces which can be used for your latest promotions, Ads etc. The widget ready footer block has an opt-in box for newsletter subscription and also comes with internal quicklinks. Embedded social media icons in the header allow users to easily connect with prominent social media networks. The theme comes with a keyword search box using which users can easily do a quick keyword search. An Advanced search box helps them search with multiple attributes. Users can also check the status of their orders from the site. Internal product pages come with support for multiple images and include a Cloud Zoom facility enabling users to see a magnified version of the part of the theme highlighted by the on-screen mouse pointer. The theme also allows users to add reviews and submit product tags. e. Also included is a Related Products extension which would automatically populate similar products as per the current selection. Users can also compare between products and can also create a custom wishlist of products. 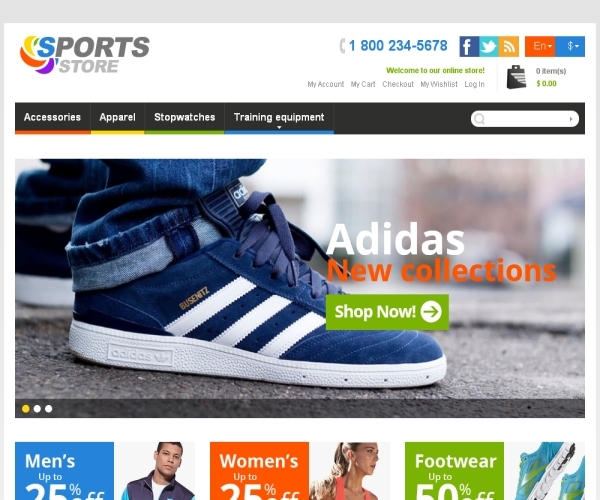 The Sports Store premium responsive Magento theme is priced at $160.